Alt art space presents If you can’t go through the door, go through the window, an exhibition that celebrates ingenuity, and the complex ways individuals negotiate the established order in order to participate in society. Featuring works by Aykan Safoğlu, Hasan Özgür Top, and Hera Büyüktaşçıyan, If you can’t go through the door, go through the window will be on view for Alt‘s inaugural season, which is dedicated to examining issues of authorship in art. In the two-channel video installation Untitled (Gülşen & Hüseyin), 2015, Aykan Safoğlu traces the life story of his uncle Hüseyin, who immigrated to Germany to join the growing workforce of Turkish workers there in the early 1960s. On one screen, Safoğlu is seen directing his friend Gülşen Aktaş to pose as his uncle, in a recreation of an early photograph. Gülşen, who lives in Berlin, is prompted by the artist to participate in an exercise designed to elicit empathy for the character she is playing. The Turkish-born artist, who also lives in Germany, is looking for insight. The second screen tells of the ups and downs of Hüseyin’s life as a cleaning person, in the form of scrawled statements and drawings on a bathroom wall. The intimacy of the juxtaposed storytelling modes relates to Safoğlu’s own search for alternative modes of survival to meet the challenges of maintaining his identity in the face of dislocation and sexual bias. 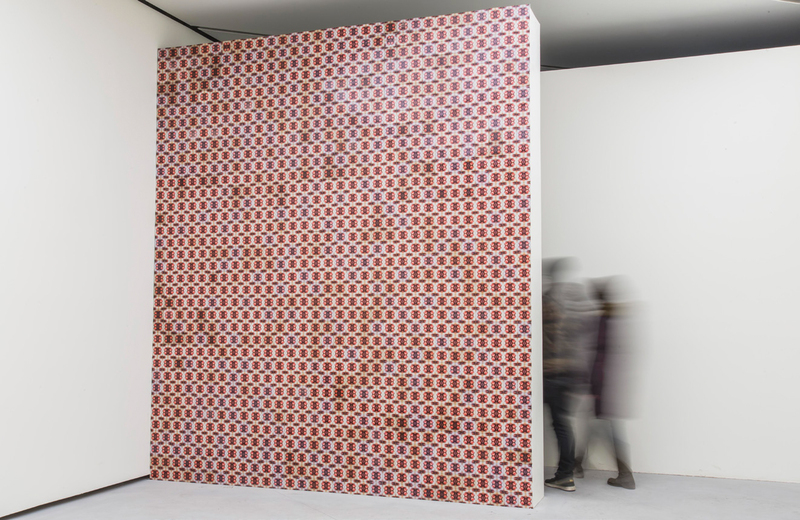 Hasan Özgür Top’s installation A Gift from the Middle East, 2013, is composed of ceramic tiles patterned in the style of Islamic chinaware, but picturing violent images of the Syrian civil war. Top has repurposed disturbing images from Youtube—in particular, of the destruction of the Great Mosque of Aleppo—in a way that is intended to bring sensitivity to the subject, and to reverse the “numbness” of oversaturation. A Gift from the Middle East is part of a larger project by the artist: his proposed restoration of the Aleppo Mosque using these memorial tiles as a gesture of rebuilding that also acknowledges wounds that may never heal. In Hera Büyüktaşçıyan’s sculptural intervention When things find their own cleft, 2016, red bricks spill out from a break in the white-cube exhibition space, evidencing the historical materials of the former factory building. The work is a fluid resurfacing of hidden histories—urban, social, individual, and political—resisting oppression simply in continuing to exist. It offers a metaphor for finding solutions, taking its name from the Turkish proverb “Water found its cleft,” which refers to how water flows under, over, and around obstacles on its way to the sea. When things find their own cleft reminds us that we too are living through renovations, and that being present is a resourceful response to the hurdles of contemporary culture.